Peaceoneday – DOZ e. V.
UKSSD is partnered with Peaceoneday since 23.06.2013. 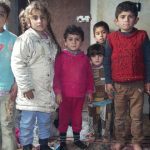 We are proud to be the first Syrian Kurdish organization which introduced Peaceoneday Campaign to Syria and the region. As it has not been working on this campaign in Syria either before the revolution or during it, the UKSSD has worked to organize the campaign “Peace One Day” in Syria in the Kurdish region to be the first organization and the first student union that works to achieve this international campaign in Syria thus place the name of Syria on the map of the participating countries on the campaign “Peace One Day” with other countries around the world. 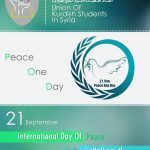 Thus UKSSD with its branches (Qamishlo, Kobanî, Tirpespiyê, Amuda ) sets up the campaign “Peace One Day” on 21. September 2013, the UKSSD worked and organized this activity on this day to offer so many activities like: exhibition of paintings of children about peace, theater, poetry, documentary films and music. You can reach all the information about this campaign through union’s sites on Facebook or through its website.